We told you not that long ago that SwiftKey is potentially on its way to iOS via the SwiftKey Notes app, but if you’re looking for a more system-wide approach to things then your only option is to spring for something that requires jailbreaking – at least until Apple sees the light and opens the door to truly customizable keyboards throughout iOS. 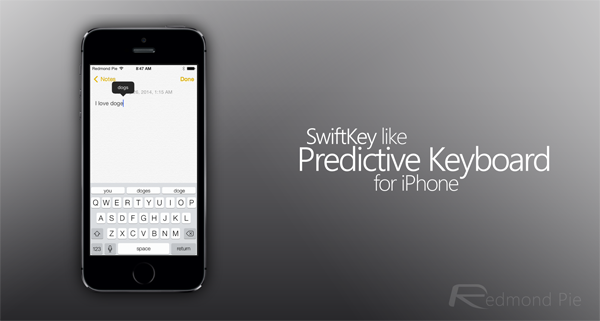 With that unlikely to happen in the foreseeable future, you might want to check out PredictiveKeyboard. If you’re packing a jailbroken iPhone or iPad then the idea of getting your hands on a new keyboard for iOS will likely be an interesting one to you, and with PredictiveKeyboad we think you might like what you see. It doesn’t go mad by changing everything about the stock keyboard, and it doesn’t want you to go swiping your fingers everywhere just to type a simple sentence. Instead, it does what SwiftKey does so well, and what users of iOS have been calling out for – good old fashioned text prediction. Once installed via Cydia for $2.39, PredictiveKeyboard will attach a fifth row to the standard iOS keyboard, but this row isn’t going to be home to a set of boring buttons. Instead, as you type you’ll notice that the new buttons change, offering new words based on what it is believed that you’re trying to type. The more letters you enter, the more accurate the suggestions will get, until eventually the one you’re after is staring at you in the face. Tapping it auto-completes the word and you move onto the next one. Magic. The developer says that no personal information is transmitted anywhere and that while the tweak does learn based on what you’ve type, potential worries about it starting to learn your passwords are, apparently, unfounded. You’ll have to take that at face value though. While the tweak does cost a couple of dollars there is actually a three-day free trial available, so if you’re on the fence about whether dropping the money for PredictiveKeyboard then you can always give the demo version a try – which is available over at the BigBoss repo -before getting the credit card out. From what we’re hearing though, you’ll soon hand that cash over willingly.